Promotional value expires 120 days after purchase. Amount paid never expires. Not Valid with Oakley, Maui Jim Products. Insurance Receipts available upon request. Not valid with other offers or previous purchases. Consultation required; non-candidates and other refund requests will be honored before service provided. Limit 2 per person, may buy 2 additional as gift(s). May be repurchased every 90 days. Limit 1 per visit. Merchant is solely responsible to purchasers for the care and quality of the advertised goods and services. 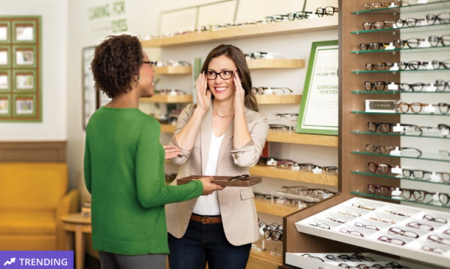 Since Dr. Stanley Pearle opened the doors to the first Pearle Vision in 1961, the number of locations has risen to more than 500 stores in North America, and the focus on going above and beyond to meet the needs of their customers with personal attention and clear answers has not changed. In these stores, onsite opticians educate you about your eyes and advanced care options before helping navigate the assortment of frames and talking straight about prices, with designer brands such as Prada, Burberry, Coach, Polo, and Vogue offering both timeless styles and modern trends.